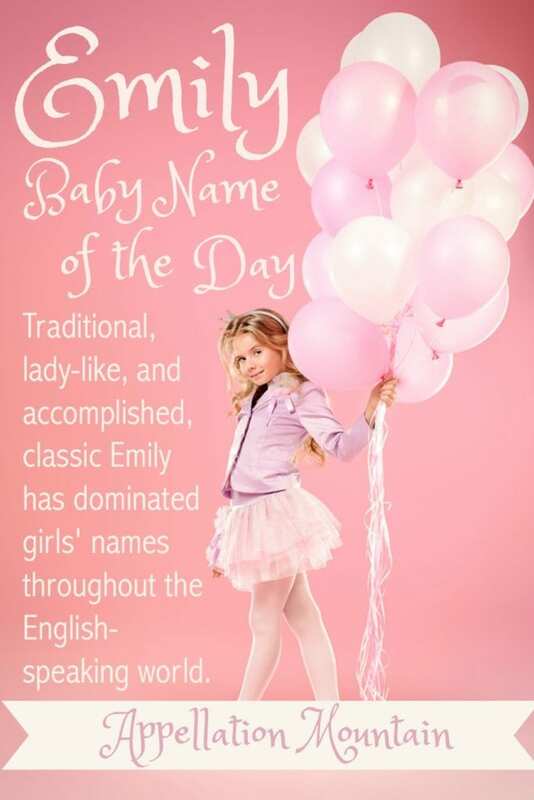 Emily reigned as the #1 name for a decade, and remains very popular today. Thanks to Lulu for suggesting our Baby Name of the Day. Unravelling the threads between Emily and Amelia presents some challenges, but they’re not directly related. Amelia comes from Amalia, ultimately from the Germanic element amal – work. Emily, on the other hand, starts out as a feminine form of the old Roman family name Aemilius, via the masculine name Emil. In Latin, aemulus means rival. But in real life, those lines blur. Royalty gets credit for reviving the name in the eighteenth century. The future King George II welcomed a daughter in 1911. Her name? Amelia Sophia Eleanor. George may have become King of Great Britain, but he was born and grew up in northern Germany. His daughter Amelia was born in Germany, too. Her family called her Emily. George II’s grandson ascended the throne as George III in 1760. He, too, named his daughter Amelia, honoring his aunt. Both Amelias shared the same affectionate nickname, too. The two princesses helped revive the name in their adopted land. The first wave of late eighteenth and nineteenth century women by the name accomplished much. Texas gives us Emily Austin Perry. At one point, she was considered the wealthiest woman in Texas, at a time when few women owned any property. Mrs. Perry established educational institutions, helped secure railroad service, and more. While the name has never left the US Top 300, by the 1960s it had fallen from favor. Then came 1964 movie The Americanization of Emily, set during World War II and starring Julie Andrews as an Englishwoman who falls in love with an American soldier. The movie included a title song, simply “Emily,” which became quite popular. Tony Bennett and Frank Sinatra both recorded it. We also met Emily Elizabeth, the young owner of Clifford, the Big Red Dog. The duo has starred in more than six dozen books, a television series, and may still get a full-length feature film. Norman Bidwell wrote the first book in 1963. By 1973, the name had entered the US Top 100. In 1991, it made the Top Ten. Two dozens years later, it remains near the top of the charts, at #8. The name remains equally popular throughout the English-speaking world. Other spellings appear in the current US Top 1000, including Emilie, Emmalee, Emmilee, and Emely. And, of course, dozens of other Em- names, like Emerson, have risen in recent years, too. Today, actresses like Blunt and Deschanel, songs from Simon & Garfunkel and Lady Antebellum, and fictional characters on shows like Revenge, Pretty Little Liars, and Criminal Minds combine to make this something of an everywoman name. All of this makes Emily an indisputable classic, as traditional and enduring as Elizabeth. The downside is that the name can feel anonymous; almost the Jennifer of the 1990s. Today the name is fading, and probably seems ready for a rest. But it has achieved such traditional status that it will almost certainly remain in heavy use – and one day, even feel fashionable again. This post originally published on July 31, 2012. It was revised and reposted on October 17, 2016. I was named for the song! Born in 1981, I knew lots of Emily’s growing up that were my age or older. It always surprises me to hear it really peaked much later. I was wondering if you would ever cover my name. I love being an Emily, and I have a hard time finding any other name that would suit me quite as well. I love that it feels British, Victorian, and oh so litetary, but I also love that it is simple, sweet, and homey. Plus, it’s pleasant to say – Emily, Emily, Emily – it trips lightly off the tongue. Just curious: what are some of the other medieval y-enders you were thinking of? Growing up in the 80’s, it seems like there were quite a few Emilys around, but the name doesn’t feel boring, rather it feels familiar and cozy. I guess I’d put Emily in with other dainty names like Holly and Laura — Chamomile tea instead of Pabst Blue Ribbon. Some names feel timeless, instead of trendy, because they’re simply nice names. Julie, this might be my favorite comment ever! 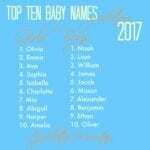 I agree with you Julie, other names that fit in that category for me are Katherine, Elizabeth, Claire, Sarah, Anne…very classic British names that seem to span the generations. Please explain what you mean. Claire is a French name. Elizabeth and Sarah are biblical names. maybe she just means commonly given to children in Britain, therefore British. If I can a name American, I don’t mean that’s it’s origin. There’s a whole category of names that I think of that feel just write with “Lady” in front of them and a hyphenated family surname behind. 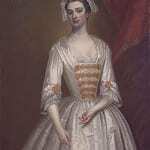 Lady Sarah Wyndham-Smith, Lady Caroline Hampden-Price. For me, Claire doesn’t spring naturally to mind, but I get what you mean. About royal names… they sometimes took names that were crown names, that weren’t even truly part of their given names, as I understand it. Could that have been a possibility with the ones called Emily in these instances? Amelia and Emily (and Amelie and Emilia) are certainly close. There are plenty of examples of two similar names converging, especially in early Norman England. In those cases, I tend to think that many centuries of use – and limited original sources and a lack of standardized spelling – make it impossible to find the line. For Emily and Amelia, there’s some blurring in medieval England. 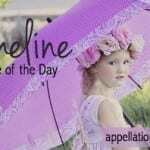 There are names like Emelisse in use – she seems related to Emmeline, which is a diminutive form of Amelia via Amelina, but it would be easy to get to Emelisse from Emily, too. Here’s the fuzzy part: if Emily and Amalia had remained in frequent use in English, I think I’d view it differently. But Amalia is clearly in use for generations, appearing amongst German ruling families from the 1400s. Amal is a major element in German names for centuries before, too, with clunky antiques like Amalafrida and Amalgaldis in use. (There’s a nineteenth century German name guide here. I don’t read German, and Google translate is highly imperfect, so I could easily be missing something.) There is at least one Saint Amalburga from the 600s, though she is sometimes called Amelia today. The first time the two are used as variant forms is with the House of Hanover. That’s recent enough that I’m confident the names have separate histories and evolutions. There’s some debate about the meaning of Aemilius … which is actually fascinating, because it does make Emily and Amelia share the same meaning. If you accept that “to rival” means to work hard to excel, to be a challenger, to strive, then it isn’t too far of a stretch to say that Emily means “industrious.” Our word emulate also comes from the Latin aemulus, so it isn’t an impossibility. On balance, I would say these are two separate names that are slowly becoming indistinguishable. Throw Emma – or Emmalee – into the mix and it becomes even more of a tangle. As for crown names, there are endless reasons members of ruling houses took other names over the years. At the risk of generalizing, I think it is safe to say this: whether you were a king or a commoner, at many points in history custom dictated what you named your children. There was little element of choice. Factor in the possibility of a foreign marriage, and the complications build. My favorite example is the ill-fated Princess Alix of Hesse and by Rhine, the granddaughter of Queen Victoria. Alix was named after her mother, Alice. (Yes, Alix is medieval French, and Adelaide might have been a better equivalent – but, hey, they didn’t have Google.) Alix became Aleksandra when she married the heir to the Russian throne. And so Alice became Alexandra … perfectly logical in their moment. all this is incredibly fascinating to me. I also love learning about Emelisse, that’s very pretty! And why not add another ’emel’ name to my list? Love Alix also. That was such great input… so educated, so well-examined. Thank you! 🙂 How refreshing. Emily is lovely, I’ve had a love/hate thing for Emily all my life. I love Emily because she feels substantial yet is airy & light. She fits a lot of girls/women and I love that sort of versatility. If I can picture the name on a 100 year old & a newborn, all the better in my book. I hate Emily because she looks & sounds very frilly. @Jordana: My surname is a three syllable ends in -ee sound monster too. It was featured during bad name week here, even. So not only does my surname feel like an airy monster, it screams ‘girly’ to a LOT of folks. And still, Cecily is our top choice should we have another girl. I wouldn’t let that -ee end stop me, I’d pair Cecily with some -a & -e enders though, and use those middles a lot! (our Cecily would be Cecily Pandora Jane). I really love Emily, but not its popularity. I adore Emily Dickinson (my daughter’s middle comes from my favorite poem of hers), and would consider it for a child despite its numbers if I didn’t have a cousin named Emily. I’ve known quite a number of Emilys over the years, too. The husband, of course, loves it. I’ve tried to convince him that Cecily is the new Emily, but he’s not biting. Totally random reference, but wasn’t the little colonial sister taken by the Sanderson sisters in Hocus Pocus named Emily? Since this is my name, I thought I should comment. In tenth grade I had to write about my name for English class, and looking back on that assignment I still stand by everything I said. I’ve always had a love-hate relationship with my name; love it because it’s a pretty name, hate it because the popularity makes others see it as boring. I could think of no better name for myself though. Emily is versatile; she can be anyone. Emily is melodious, delicate, and sweet. It’s feminine without being frilly. I like that Emily is timeless and not a name tied down to any one time period. There are really good reasons why this name is popular. Emily, I was going to say something similar about the versatility. It’s a name that, to me, could be worn by anyone rather than conjuring a specific type. My mom really thought I should name my twins “sweet names” like Emily and Claire. (She’s the only one I know personally who didn’t like the names we chose, at least at first.) I too think they’re sweet names, but they’re not my style. I do love Emilia, though, while Amelia leaves me luke warm. The first Emily I ever met was when I was in 7th grade. It seemed very cool and just unusual enough. At the time (1982) it hit the sweet spot of fitting in *and* standing out. I still really like it (and Emma but not Amelia) although I’d never use it – I know too many, it’s too popular, and my name is Amy. my good friend Amy named her daughter Emily, I think it’s rather cool. I somehow hate Amelia and Emma yet love Emily. I can’t explain that at all. Surely if one ticks your boxes the others should? I do like Amy though, so maybe I just have an affection for those ill-fated -ys? It does have a bit of that good-girl imagery to it. I think it was a Lucy Maud Montgomery novel where I first fell in love with it (Emily of New Moon, of course). I generally like the vaguely Old West/Edwardian names that have fallen further down the charts, Martha/Jane/Susannah etc. But Emily still fits that feeling for me, it’s just so popular its a bit depressing. I agree, I totally see this in that “old west/edwardian” vibe. Loved the Emily books also. I actually went to school with an Emily – she was kind and sweet. I honestly don’t think there’s a good reason not to like Emily except for how ever-present she is. I like Emmeline more, but I also like the approach people used to take. Naming your daughter Katherine meant she could go by Katherine, Kitty, Kathleen, Kathy, etc, not just one of them. 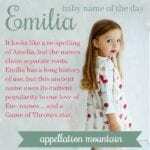 so I see no reason why you can’t name a child Emmeline and she use Emily, Emma, Emilia, just as well. Emily is beautiful and the more I say it the more I like it. I wanted to use it for a while because it sounds great with my last name, but alas, the name nerd in me couldn’t stomach how popular it is. I actually disliked it a lot as a child/teen. I even felt bad for the few that I knew. Isn’t the doll in A Little Princess named Emily? It’s ways seemed like a goody-two-shoes name to me. I don’t know why. It feels like Sarah – pretty, classic, off the charts in popularity, not for me. Sorry for all my ongoing typos. Smartphones aren’t so smart. What a sweet, lovely name. There is nothing not to like about Emily. Of course, I volunteer with high school students and in a group of 40, there are 4 Emily’s. However, each girl just seems perfectly suited to the name. Unlike most names that were #1 once, Emily never sounds dated to me. It’s a little too familiar for me to ever use on our child, but I still really like it. You mention that Emily does surface in medieval England, and I feel the urge to specify that the heroine of both Chaucer’s The Knight’s Tale and its inspiration, Boccaccio’s Teseida, were named Emily/Emilia. Those 14th-century uses of the name make Emily a truly literary selection. Thanks, Charlotte – that’s a great addition.